Two residents of a Batamaloo neighborhood in Srinagar with similar names were picked up by forces of 22 RR and subjected to enforced disappearance seventeen years ago. Was it a case of mistaken identity or a carefully planned operation, the family is waiting for answers, Umer Beigh reports. Wearing a traditional Kashmiri Pheran and a white scarf placed over her head, Azra Begum, 66, is sitting inside a room in a three-storied building located in Tengpora on the outskirts of Srinagar city. A framed picture of her youngest son, Mushtaq Ahmaed Dar, who is wearing a traditional Karakuli cap in the photograph, has been religiously placed on the shelf of an almirah. A mother of five children, Azra looks dignified and well-kept. “I can’t bear harsh light. If our doorbell rings, I shiver with fear,” she says. On a fateful day in the year 1996, forces belonging to 22 RR posted in a neighboring locality arrived at her residence at around 12:30 am. It was April 13. “I was sleeping next to my son. They appeared mysteriously, like demons, because the doors were closed. We were frightened. I can’t recall their exact number, but once they got inside our home they started beating everyone including women. They were demanding to produce my son,” she says. “I didn’t get a chance to see him one last time. I still remember that he coughed when he was being whisked away by the forces. This was a signal to us that they were taking him,” Azra said and broke down. The forces of 22 RR had appeared at the house of Mushtaq Ahmad Dar, an auto-driver, after picking up his neighbor Mushtaq Ahmad Khan on April 13, 1996. Whether it was a case of mistaken identity or a carefully planned operation is not clear. The area was cordoned off and an eerie silence prevailed in the locality. No one in the congested neighborhood was aware about the happenings at the houses of Dar and Khan. = Khan was working as a daily wage worker in a government department. His wife, Rafiqa Jan, 43, had three children. Three months later, after her husband was subjected to enforced disappearance allegedly by forces of 22 RR, her youngest daughter, Farzana was born. In all these years, Rafiqa has struggled to raise her children. “I was asked by my parents to remarry but I refused. My sole concern is to look after my children. How could I do that?” she asks. Amir Khan, 19, her eldest son has a vague recollection of being with his father when he was alive. For the rest of his siblings, they don’t know who their father was, “For a long time, they were not aware of the reality till they became conscious,” Rafiqa says. Rafiqa claims that her husband, Mushtaq Ahmad Khan, had good relations with Dar. “They were childhood friends. You can ask anyone in the neighborhood, they will tell you about their friendship,” she says. When armed militancy broke out in Kashmir valley in early nineties, Dar became a militant to fight against the Indian forces. After a brief time, he was arrested and sent to jail on charges of connections with militant groups. 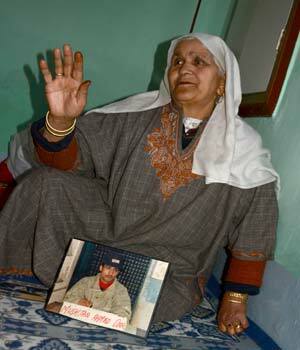 He spent two years of his life in Srinagar’s Central Jail after which he was released. To earn his livelihood, Dar became an auto-rickshaw driver. The government forces however suspected him of being a sympathizer of militants. = On April 13, the forces of 22 RR first conducted a raid first at Khan’s residence. They barged into their house and Mushtaq Ahmed Khan was detained in a separate room for almost an hour during which he was subjected to questioning by the Army personnel. “I don’t know what they asked him. They came out of the room after an hour and took him away,” she says. The forces of 22 RR then forced him to accompany them to the house of his namesake, Mushtaq Ahmed Dar, who lived a few blocks away. It was thirty minutes past midnight. Khan, who was brought to Azra’s home, was asked to identify Dar. Later, both of them were locked in a room and ‘interrogated’ till the rise of dawn. “Give us weapons. Give us guns,” Dar’s mother, Azra recalls forces as saying. “They beat me ruthlessly with the butts of their weapons. They hit me on my face too,” she says. At that moment, Azra points towards an injury mark on her face and the gaping spaces left in her lower jaw by teeth which were shattered during the assault. Being illiterate, she couldn’t understand the language spoken by the Army. “I had nothing to give them. But they didn’t seem to listen,” she says. “We could hear their screams and splashing of water in the room adjacent to the room where they were held and locked up,” Azra says. “They even took away the ornaments and the cash saved by Hameed after his marriage,” she claims. Hameed is the eldest son of Azra who works as a laborer. “We were scared. They could have done anything to my daughters, so we started shouting to awaken the people living in the neighborhood. The forces were annoyed and perhaps changed their plan. They took both of them away just when the call for morning prayers was being made in the mosque,” she says. = When the people living in the locality got to know about the incident, the situation became violent and clashes broke out between locals and Kashmir police, till Dar’s family managed to get an FIR registered at Parimpora police station. Both families went from pillar to post in search of the victims but they ended up without getting any clue about their whereabouts. During this time, the two families claim they got in touch with some senior Army officials who promised to help them in finding the victims. They even claim to have offered money to these officials but nothing they were promised turned into a reality. Only hollow claims and false promises were made. After being disappointed with the police investigation, the two victim families took the case to J&K High Court where they filed a petition blaming the forces of 22 RR for their involvement in the disappearance. 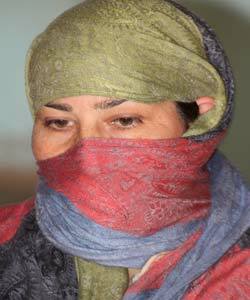 As an eyewitness, Azra told the court that the Army men from 22 RR were responsible for abduction. Even after 17 years, the High Court has not pronounced its verdict on the case and the investigation carried out by J&K police have proved fruitless. The court directed the state government to grant a relief of Rs 1 lakh to both the families. Rafiqa was helpless and accepted the offer but Azra refused to take money. “What purpose would that money serve? I want my son, my beloved. I would accept nothing less,” Azra says. Seventeen years have passed since Dar and Khan became victims of enforced disappearance after being allegedly abducted by the Army. Till now, their families have not been able to trace them. No one knows whether they are alive or not. Both the families have spent almost Rs 2-3 lakh but their search has led them nowhere. 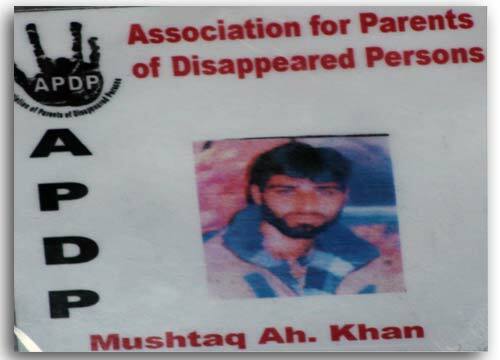 A report prepared by a civil society group in Kashmir has documented between 7000 – 8000 cases of enforced disappearances where civilians have vanished after being picked up by government forces, although the statistics have been challenged by various government agencies. “If he has been killed, at least they must show us his grave. Else, take us to the jail so that we could get a chance to see him, to know the reality. It is easy to die at once rather than dying every moment. Each day, we are caught in a dilemma whether he is alright or not,” Azra says. “I am living with a hope that he will return home very soon”, Rafiqa says with a tinge of hope in her eyes.